Anyway, I always enjoy reading your posts because they are informative, have good pictures, explanations and have good progress. Keep it up. It looks awesome. Looking good Ryan! Your info on test firing the engine was helpful. And it got me thinking maybe I should try turning mine over sooner rather than later? 1b. If I do fire it without the radiator, should the accessory belt be removed (so as not to drive the dry water pump? 2) What about the transmission fluid cooling lines? With no radiator, you don't have those lines connected right? Do you have those plugged? Or looped somehow? Or do you not have the trans filled up? I thought I had a couple others, but I can't remember them. Thanks 76455sd. Yeah I'm more concerned about having functional tail lights at this point than what year they are. That will be moved to my winter list. FormTA, the 5.3 is for sale now. 1) there aren't any issues with running an engine without coolant for under a minute. 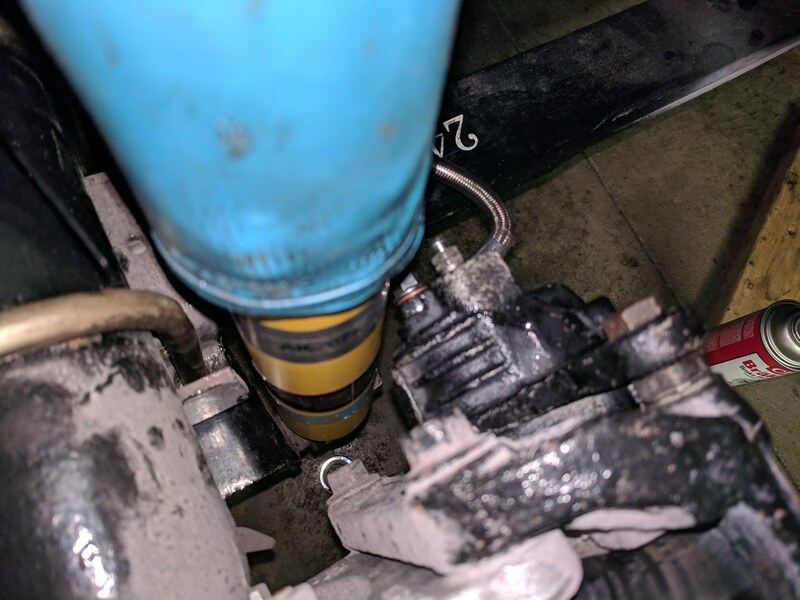 If you run it any longer than that the issue is with no coolant the cylinder walls heat up rapidly with no way to dissipate the heat. I didn't have my accessories hooked for the same reason as you. I didn't want the water pump to spin dry. Plus I don't have my pulley pressed onto the power steering pump and didn't want to test too many variables at once. 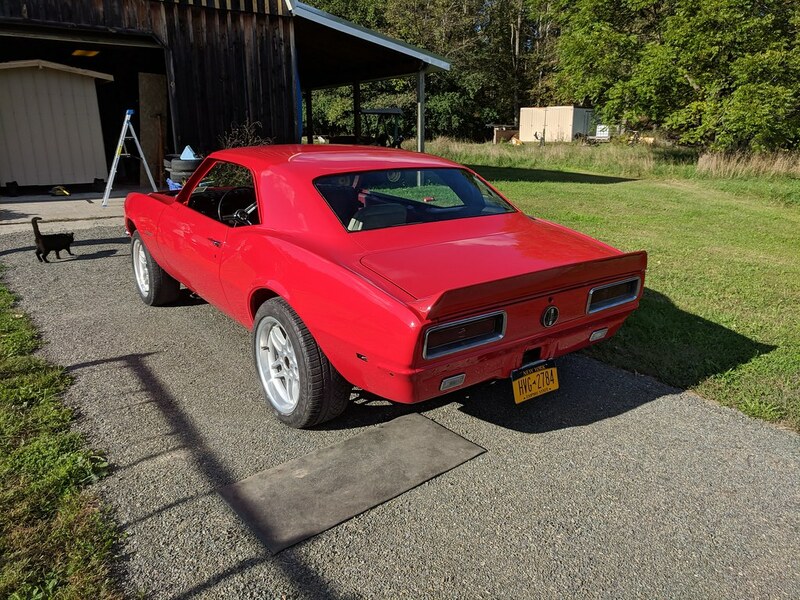 2) I have a 6 speed in my car so I don't have any cooler lines and I currently don't have a transmission hooked to the motor during the test fire. I wanted to hook as little to the motor as possible so I didn't have to undo it if the motor was junk. If I were you and wanted to test fire the motor without the radiator hooked up I would hook both lines coming from the trans together with a temporary hose. If not when you spin the engine over, it will spray fluid all over. You wouldn't want to run the engine without having any fluid in the trans as it will be spinning your trans even if it's in park. Thanks for clarifying Ryan! I'll just wait I think...Should only be a few more weeks. After 3 years off work, a few weeks wont put me behind. Any opportunity that I had this weekend I spent thrashing on this car. I didn't end up getting as many pictures as I wanted, but that's how it goes sometimes. Late last week I swapped over the oil pans to get the Holley pan on the new motor. 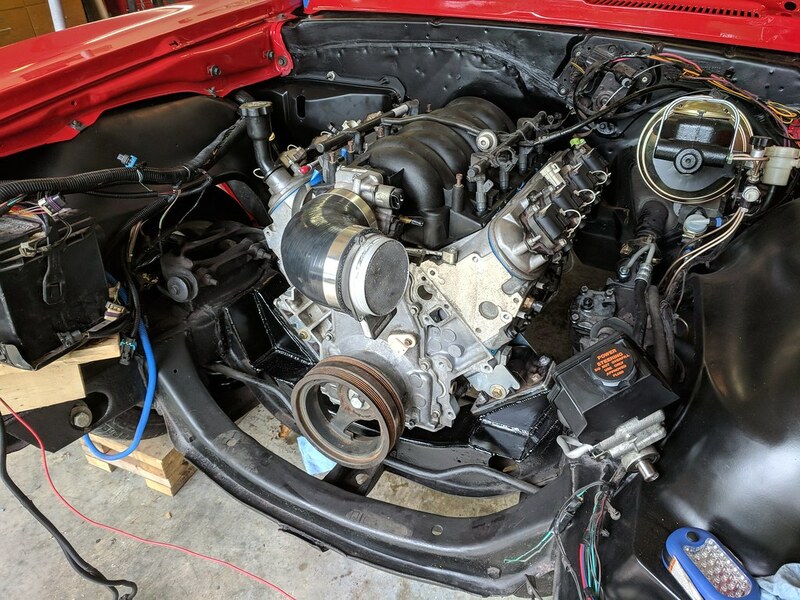 I bolted the motor and transmission together prior to torquing down the oil pan to use it as a guide to ensure the pan is flush with the motor. This is outlined in the Holley instructions, but they recommended something flat. I figured since the trans is already out to just use it. 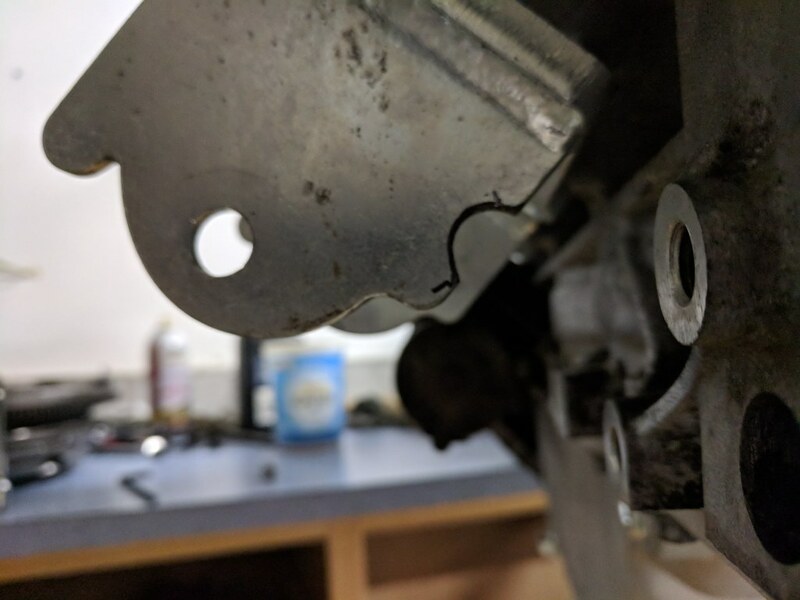 While the motor was back out I took the opportunity to make a slight notch to the motor mount for better access to the low mount A/C compressor. Much easier to get to now. 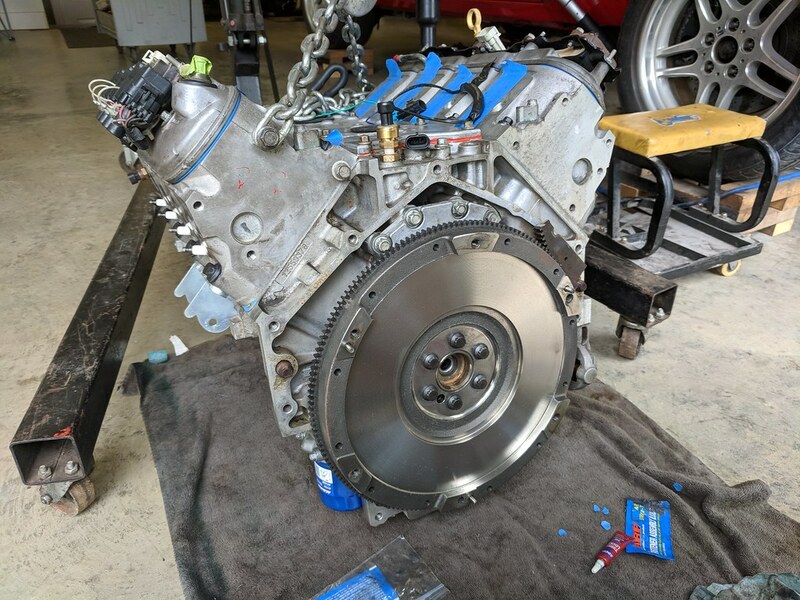 Next up was swapping over the new LS7 clutch and flywheel. Then I slid the transmission back together, re-checked to be sure that the slave cylinder was all tight and got it torqued down. Then I reinstalled the whole assembly. Now, there is a fairly large gap in progress. It took me a while to re-install everything back to the way it was. I put the core support back in after I welded two captured nuts that had broken off. One was in the passenger side fender mount and the other I had to relocate the fender brace. It wasn't centered, so I moved it where it should have been. I also pressed on the PS pulley, bolted on the new tensioner, new Gates belt, shimmed idler pulley, and other misc. parts to get the engine to run with coolant. Once that was done, I finally was able to install the dual pass aluminum radiator I picked up at Carlisle. It fit great and looks so much better than the stock one with the upper hose mount on the passenger side. It gives much more room for the CAI. Only complaint I have with the radiator is that there was no option for a manual transmission with no built in cooler. Here is some video evidence. Overall, I'm super happy with the progress this weekend. The only thing holding me back from driving it again was that I need to bleed my clutch and fill the trans with fluid. I'm hoping to get those taken care of soon, and it will be mobile again. Should hear back this week from my glass guy. 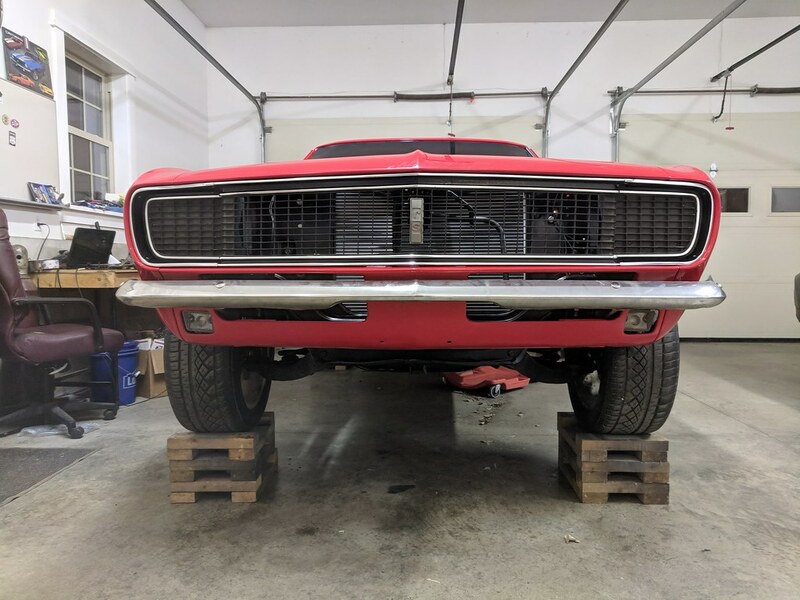 Once the glass is set, I need to install my shocks (possibly modify shock plate for rear disks), exhaust, headlights, wipers. Then get my front end back together and make an appointment for an inspection. If all goes well, I'm hoping in the next 2 weeks I can legally drive it down the road! Keeping my fingers crossed. Man you make quick work of things. Looking great. Hang in there you still have some nice days left in this year to drive it. Really coming along quite well! keep up the great work! Why would you need to mod the shock plate? To move the shock inboard to clear the backing plate/ caliper from the disc conversion. FormTA is right, I will likely have to move the lower placement of the shock to clear the caliper. I could have made life easy and used two LH assemblies to clear the staggered shocks, but I like the symmetry so I chose the hard way. 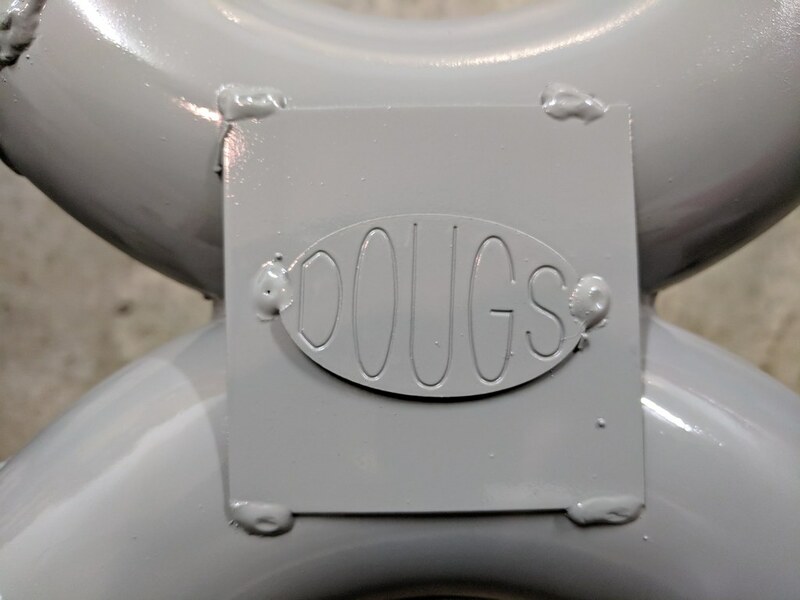 Ryan, I can't remember if you did this on your last LS build, but I wanted to mention that the oil fill extension tube comes out of the cover and the oil screw cap screws into the hole previously occupied by the fill tube. 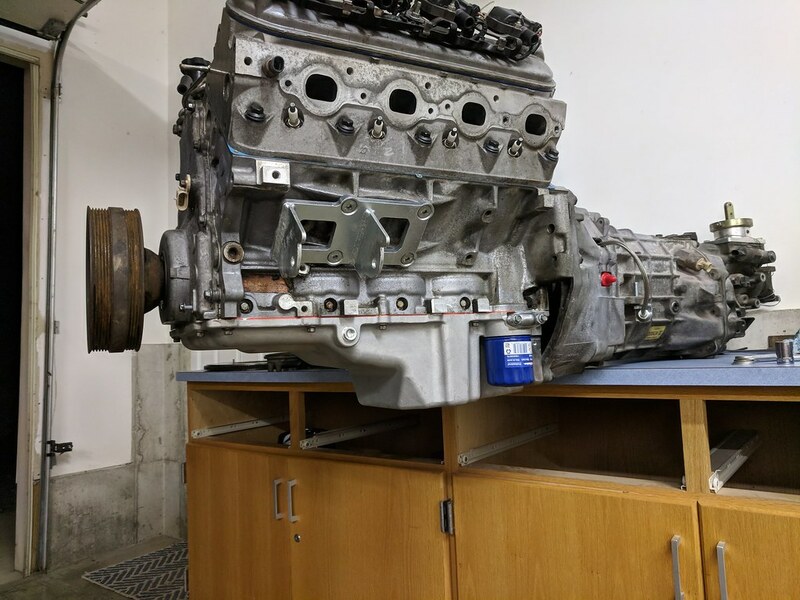 We just built my brothers 6.0 LS stroker motor and that is what we did with his. The extension never bothered me before until he did that and the look is so much cleaner. I tried deleting it and maybe it's because I'm using the flatter LS1 style coils, but without the extension on there you cannot turn the cap. When I did it originally I had the cap on first and put the coils on, but when I went to fill it I had to remove the coils to get it off. I'll have to look into it more this winter. 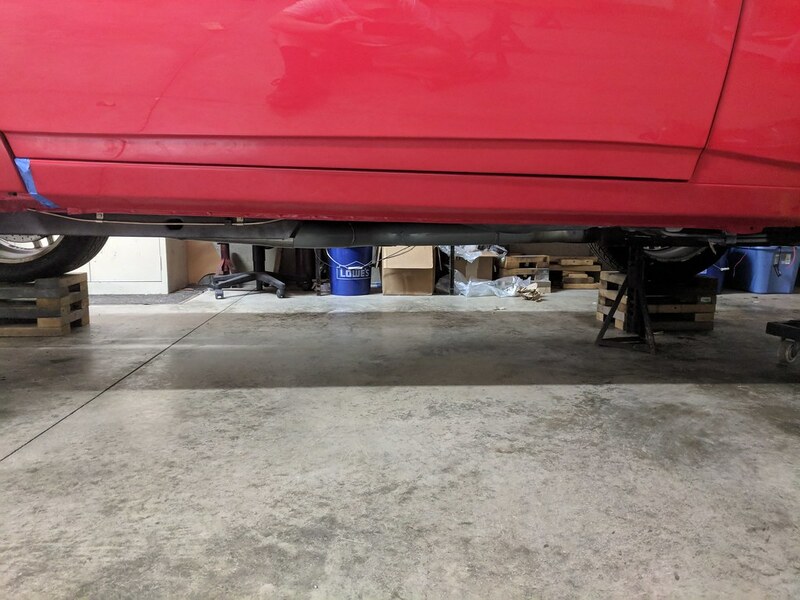 I sent an email to DSE about the springs and I didn't realize it but the springs are designed to work with their lower control arms which have a drop pocket in them. So that is the reason that mine appeared to actually lift the front of the car. I they are going to get back to me with a ratio for cutting the spring and what that translates into a drop. I've read that most springs in that rate translate to a 1:2 ratio, but I'll wait to see what they say. In other news, I got my clutch bled last night and the issue that I was having with the cam code P0343 was resolved by swapping the two outer wires for the cam sensor. This was causing the car to run in Open Loop which made it run very rich as it defaults to the conservative tables. I still have a lot of work to do with the tune, but now that I fixed the cam sensor wiring it fires right up in half a crank. Other issues I've been having is that I was getting a lot of pressure pulling from the PVC ports, but I realized that I only had the dirty air port coming from the LS6 valley cover, but no fresh air intake. 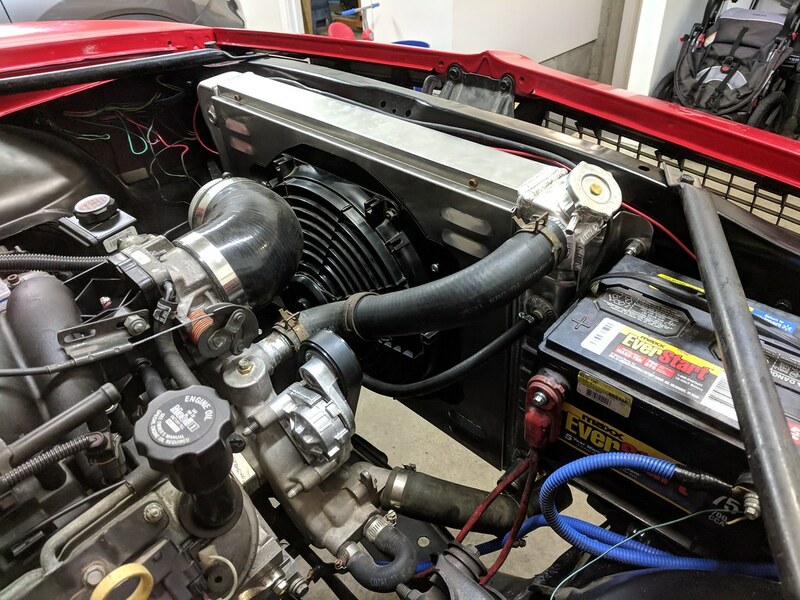 I have since connected my passenger side valve cover port to the fresh air port on my TB. I'm hoping that solves some of my issue. 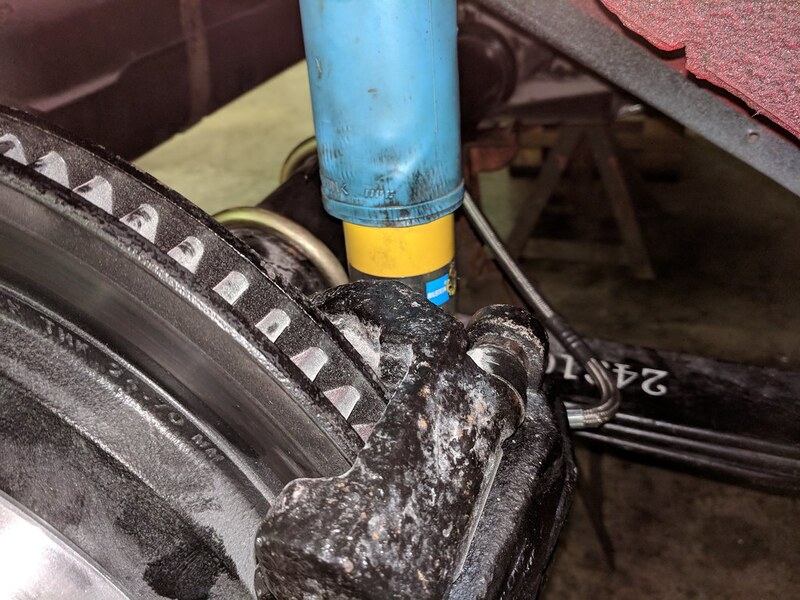 Someone must be looking out for me because when I was working on the car last night I decided to tackle the rear shock plate and see how it will interfere with my LS1 rear brakes. I chose not to use two LH assemblies because I wanted to keep the symmetry between the sides, and I just didn't like the thought of it. So I had every intention of having to modify the shock plate to relocate the shock, but it actually fit without any modifications. The only thing that I had to do was re-route my brake hose and will eventually need to bend up a new line. WIN!! The flash really makes things look dirty... Not that bad in person. Hard to see, but there is plenty of room around the shock and the caliper for it to float properly. The pads that are in it are new so that is as far out as they will ever get. Here is the driver's side. Went in without any issues. And from the rear. While I was swapping the plates I also cut down the U-bolts to a more manageable size. They were quite long before as they were for a truck lift kit of some sort. 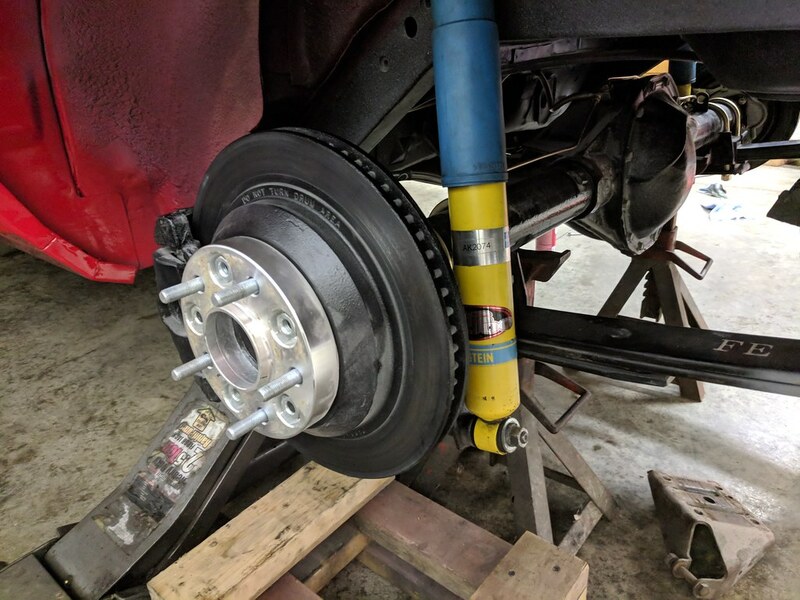 Overall, stoked that the rear shocks were that easy. I was thinking it was going to be much more complicated. 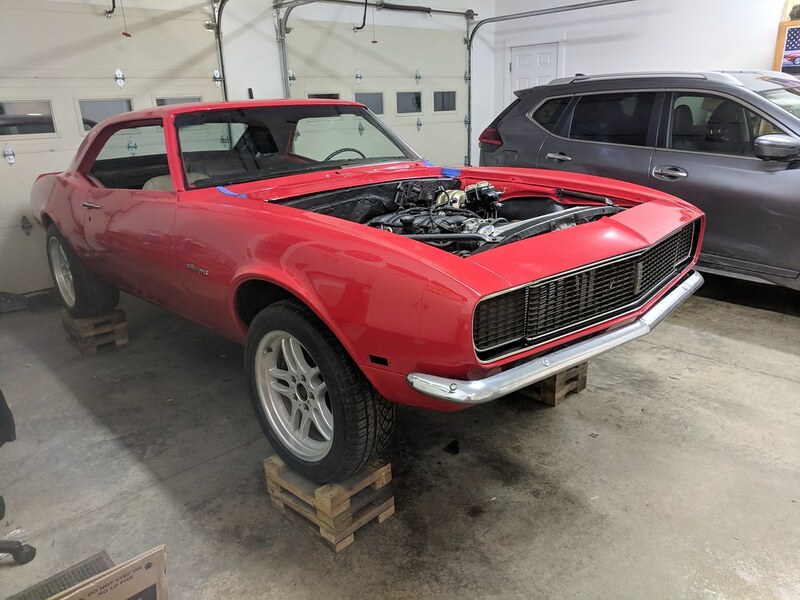 Now the biggest things I need to finish before I can get it inspected and drive it are a windsheild, wiring for signals/headlights, re-install front end and fabricating an exhaust. Unfortunately the glass guy was supposed to come today and install, but they canceled yesterday so it won't be until about two weeks when they can come next. 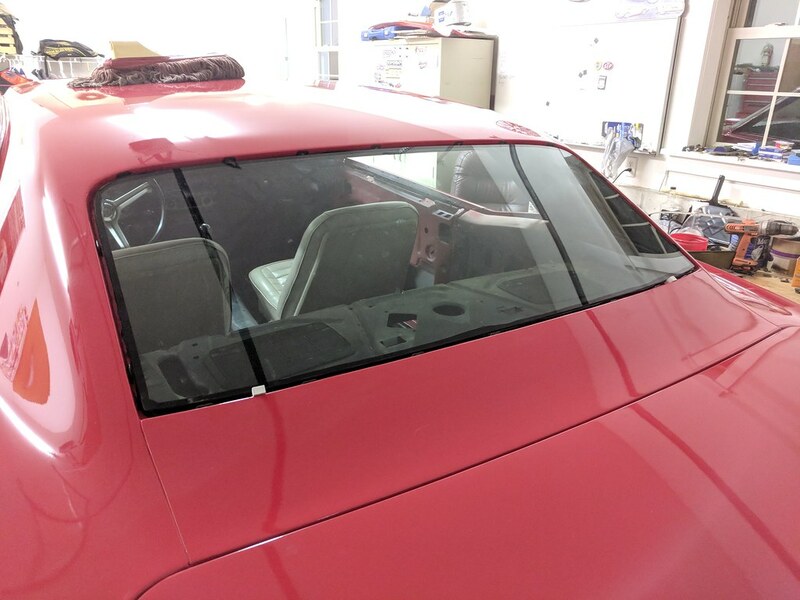 So my goal now is to get everything else done so I can maybe coordinate the glass being installed in the morning and an inspection that afternoon. That's a good idea, I'll just run it through the travel and see if I have any issues. As for the glass, I was able to have my father-in-law stop over and let the guy in this past Friday. It was a combination of me being at a conference all last week and their schedule for the week before. But now the glass is installed for good! I had to install all of the trim clips before they installed the glass. I'm very happy that I ended up buying new glass. I wouldn't have been happy with the old glass with scratches and delamination. Before I could install the new glass I wanted to get the VIN tag reinstalled. Cleaned it up and resprayed it to match the dash. And with the new glass! So happy with the way it turned out and I ended up getting the glass with the slight green tint and top dark strip. 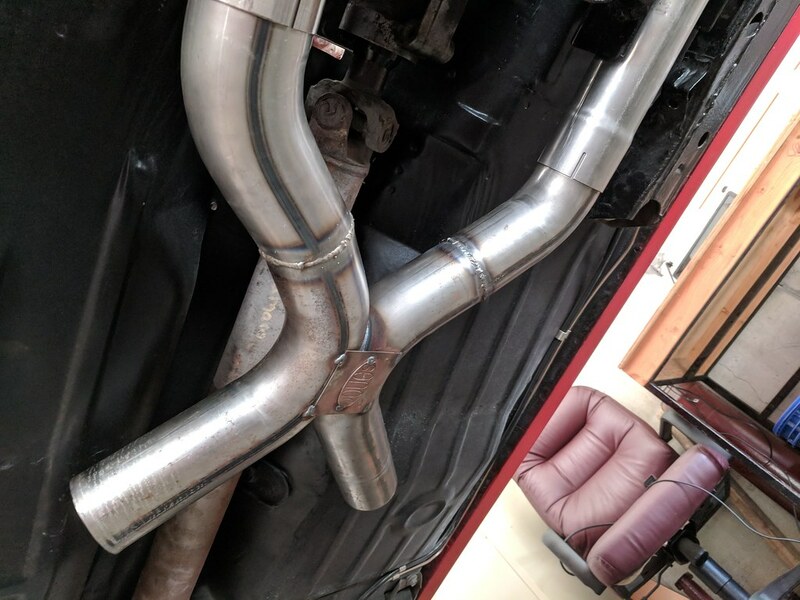 Next up on my list of things to do was finishing my exhaust. If this was one place that I was going to go a little cheap on it is here. I didn't want to spend a lot for a few reasons. I'm not entirely sure what the future will hold for me. I would like to try my luck with a turbo and that would mean I woudln't use the majority of this system. 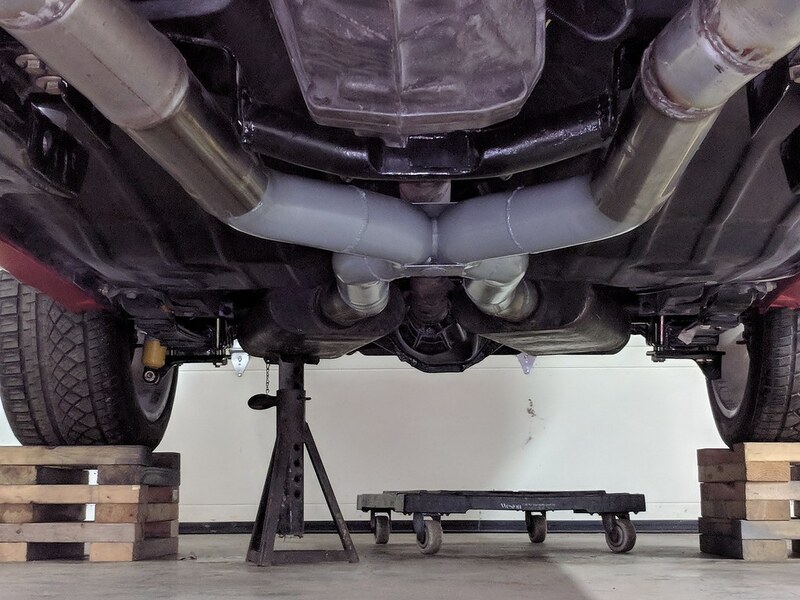 On the other hand, I may want to stay NA and get a proper exhaust with long tubes and etc. 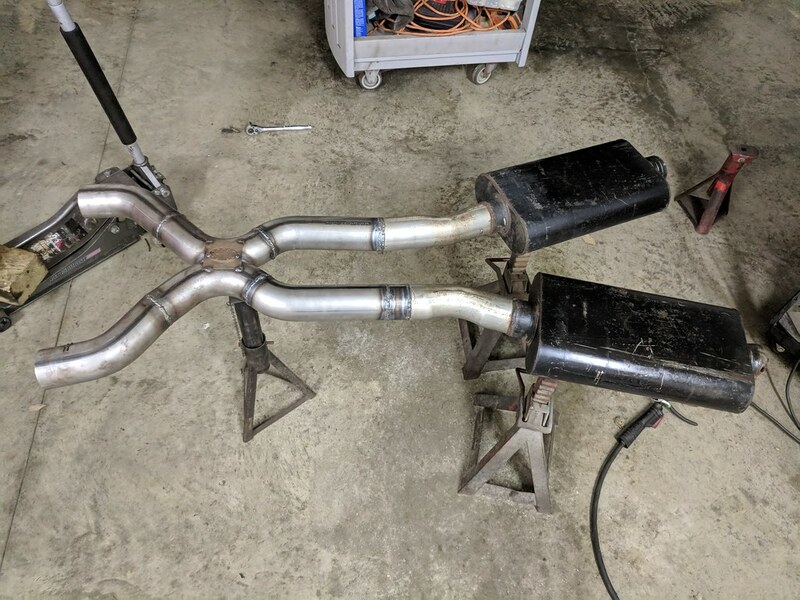 Either way I basically re-used exhaust pieces that I had or had given to me. 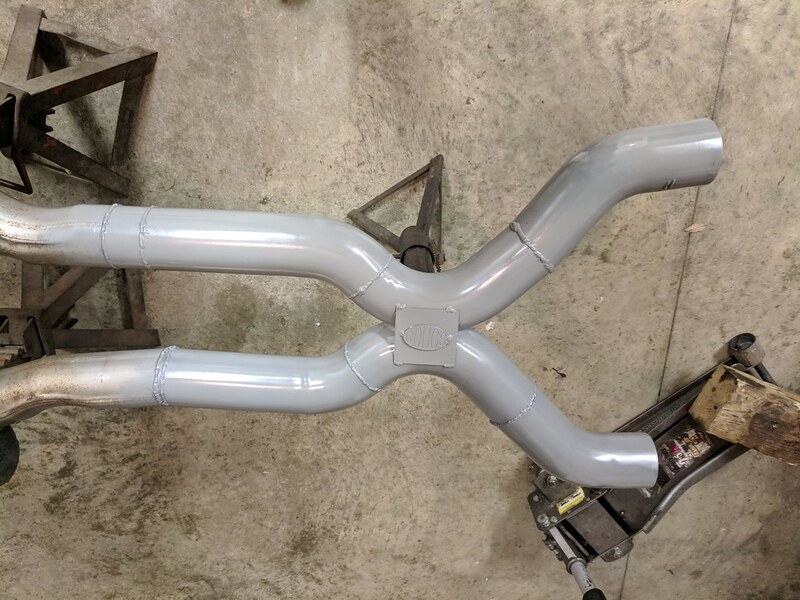 I've got about $100 bucks into it including the headers, v-bands for the headers, x-pipe kit, and Flowmaster Super 40 mufflers. It took quite a while to get all the pipes lined up and kept in the center. 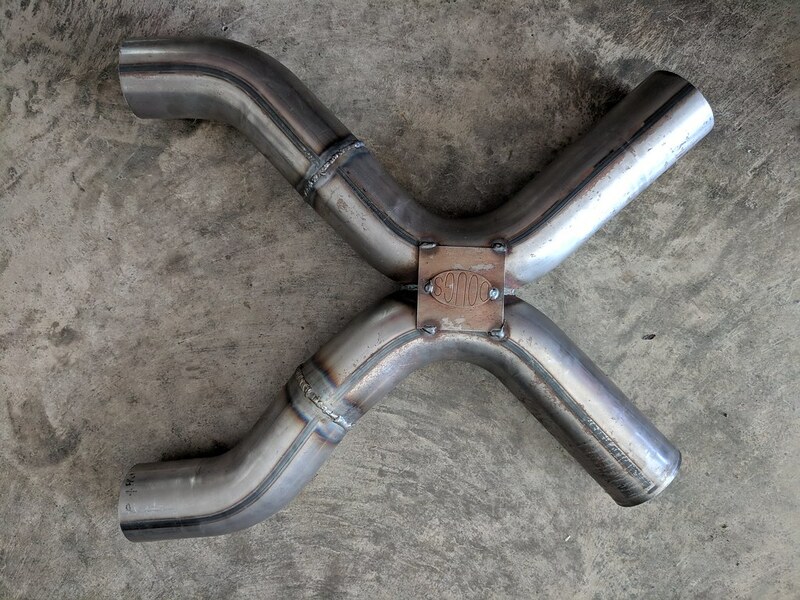 I got the 3" pipes as close to the floor as possible while still leaving room for it to have proper airflow. 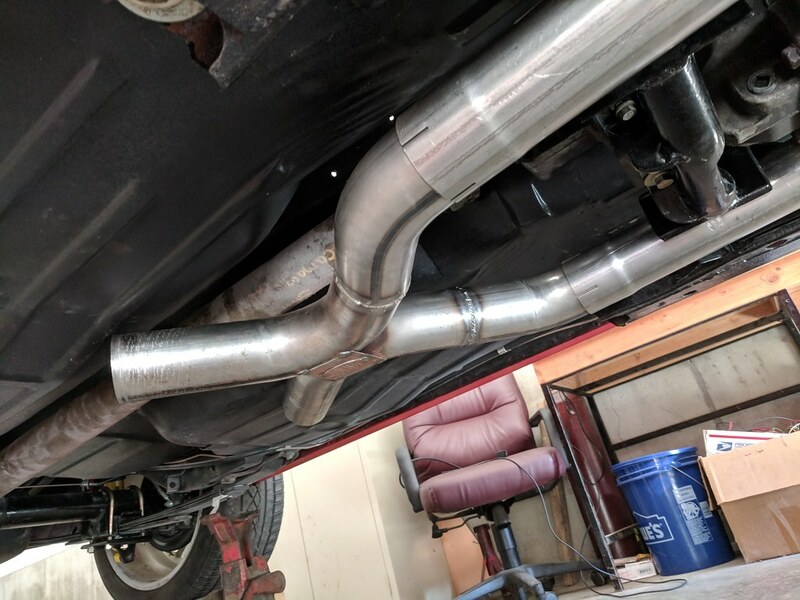 Then I was able to get the mufflers on and fully welded. I'll be running turn down's for the time being while I think about if I want tail pipes or not. Then I sprayed some high temp paint to help with rust. Doesn't look like it, but there is plenty of room around the driveshaft for it to move up and down. 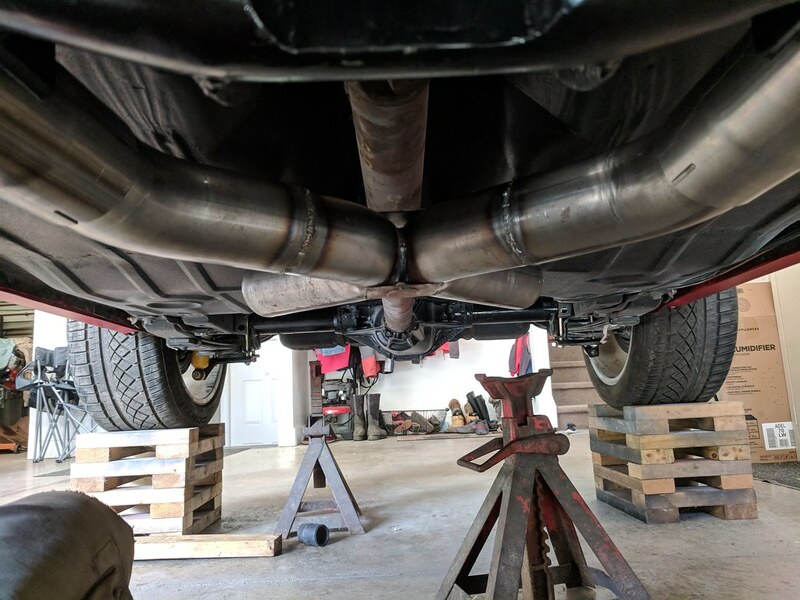 I'm very happy with how the exhaust tucked up so nicely. 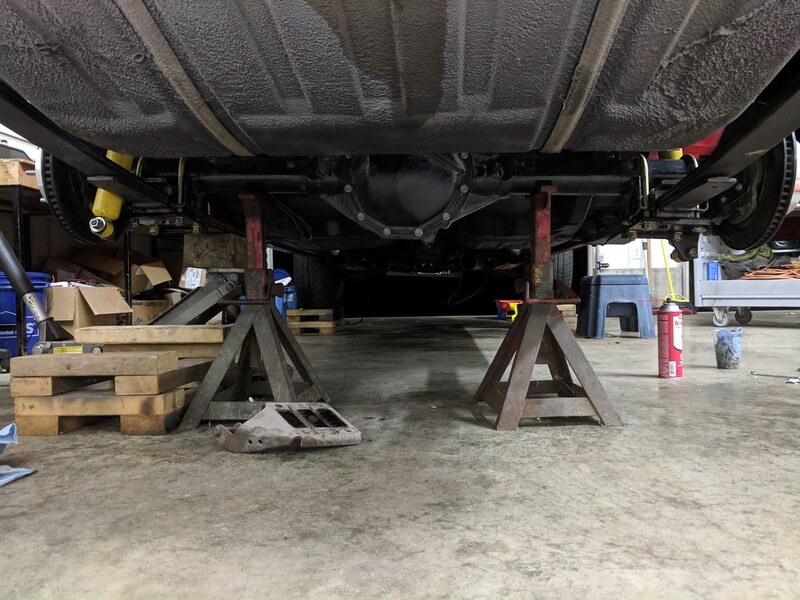 The notches in the transmission crossmember helped out tremendously with this effort. This is roughly level with the frame. I started it up quick to see what it would sound like and it has a low mellow rumble which I was really digging. But It had a few exhaust leaks to fix before I can get a true sound. I just need to get some exhaust clamps and weld on some hangers. 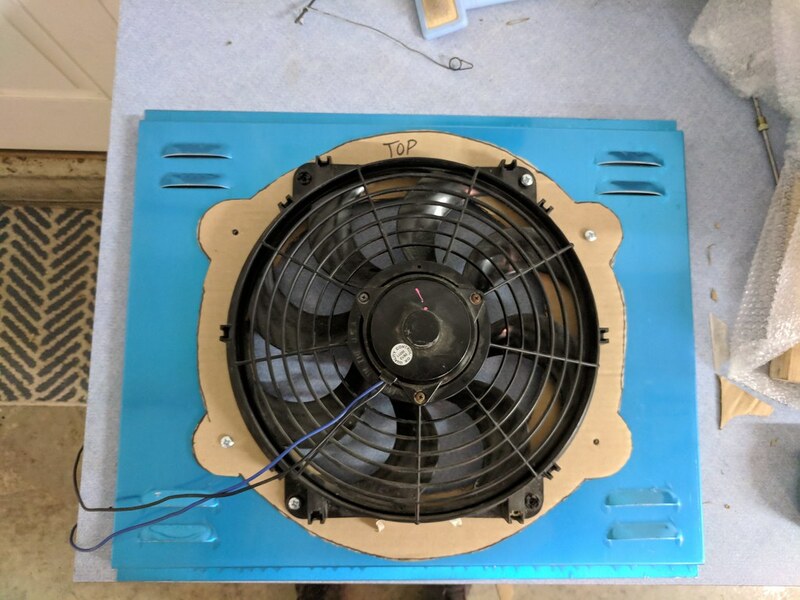 One of the next smaller projects I have been working on for the last few weeks was my cooling fan project. 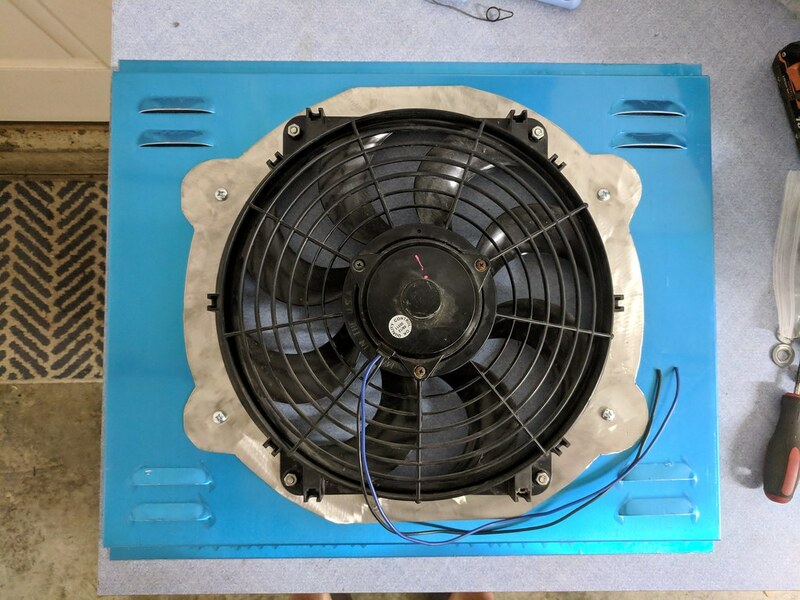 I bought a universal 14" cooling fan before I bought this dual pass radiator with shroud, but the fan shroud is for a 16" cooling fan. Being that this is a Penny Pincher project, I gave it some thought, took a few measurements and decided to make an adapter ring. 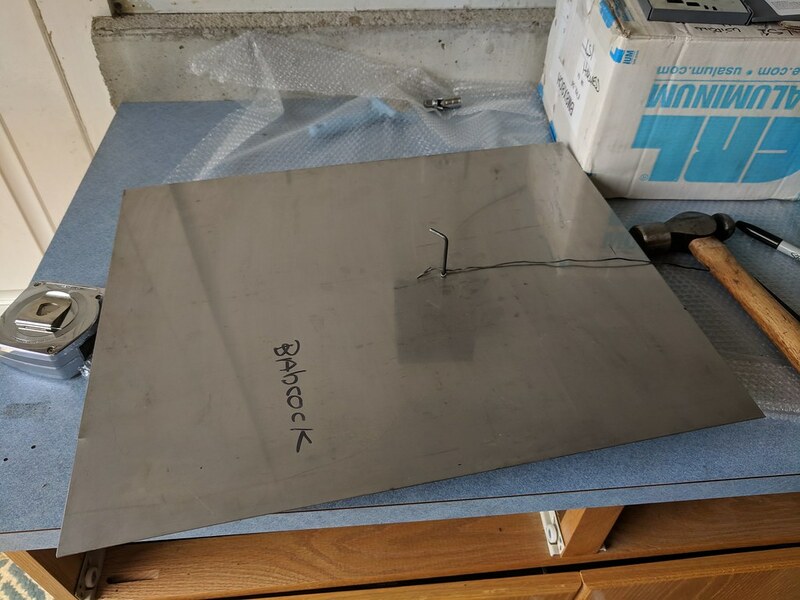 I had a sheet of heavier gauge stainless from my gas tank project I didn't and that fit the bill. Started out with my trusty cardboard template. 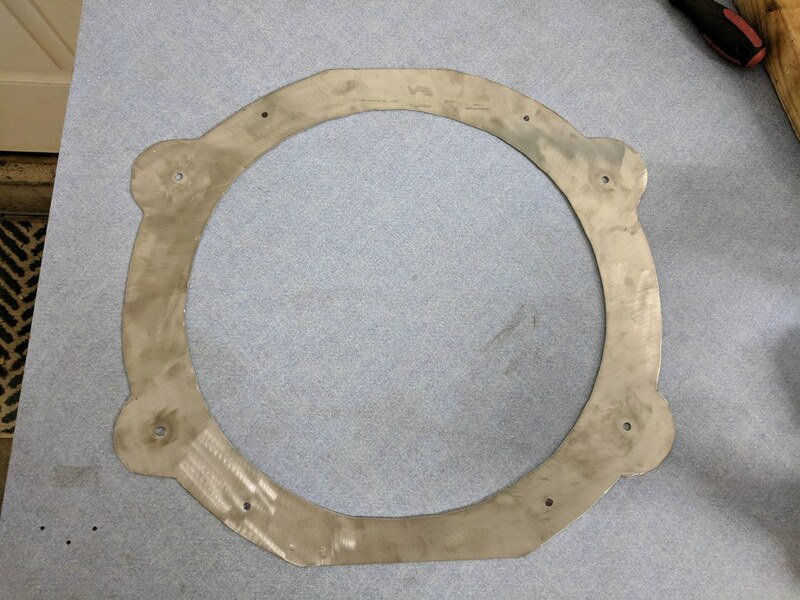 I welded some stainless studs to the back side of the adapter ring for the fan to bolt to then used the existing weld nuts that were on the shroud to mount the ring assembly to the shroud. I also was a little disappointed with the shroud itself. 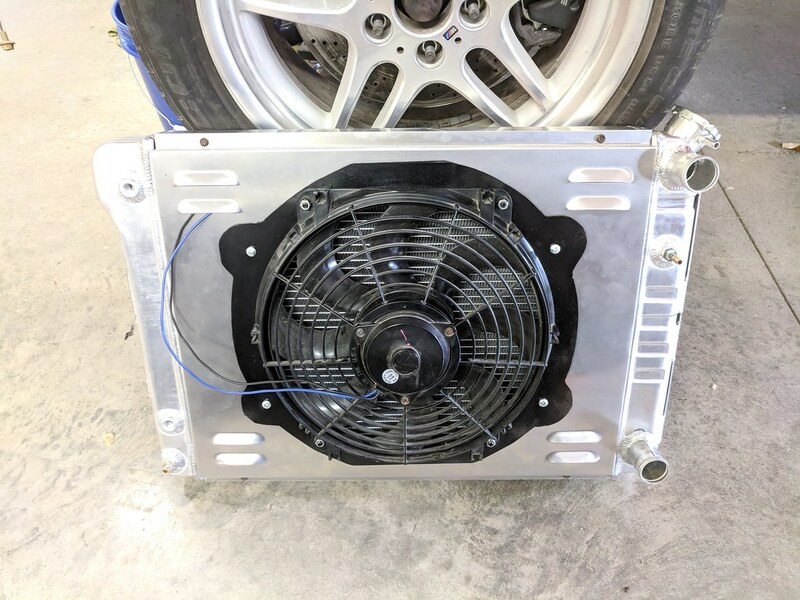 I bought them as a pair so that I could minimize my fabrication and turned out that the fan shroud was about 1/4" too wide to fit between the radiator tanks like it was supposed to. After giving it some thought I trimmed the top and bottom widths to match the radiator and bent the sides in to match. It worked well, but was disappointed that I had to modify something that was supposed to work together. Here is the complete assembly waiting to go back in. I'm hoping to get the last few things on my list done this week and schedule an appointment to get the car inspected. 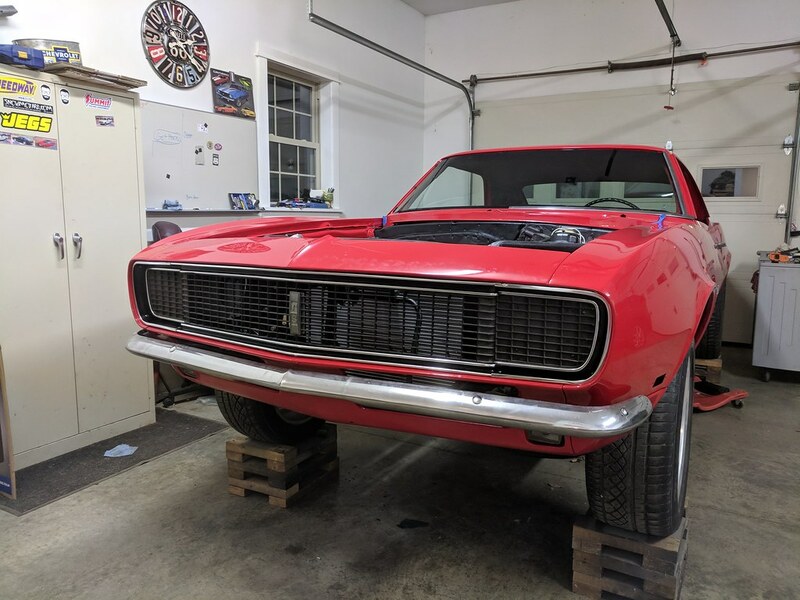 I tried to tackle the harder things first, so now that the windshield and exhaust is nearly done, I should be able to get the last few things done this week. 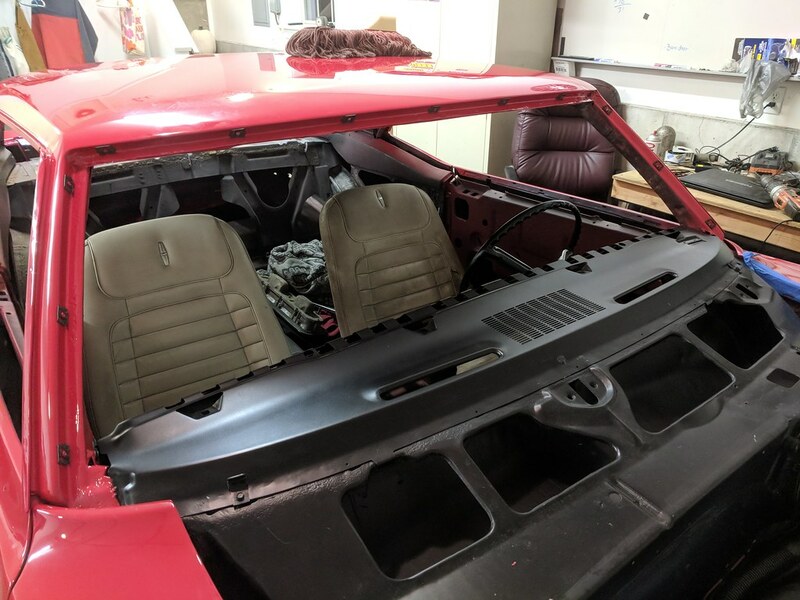 I'm basically down to: functional wipers, lower trim on the front glass (holds down the cowl piece), seatbelts, side mirrors, horn, re-install front end/hood/cowl and double check signal wiring. You're almost there Ryan, gonna sound like a broken record but your work is top notch. You'll be glad you went with new glass. I dont think it cost all that much and it looks so much better than the old stuff. 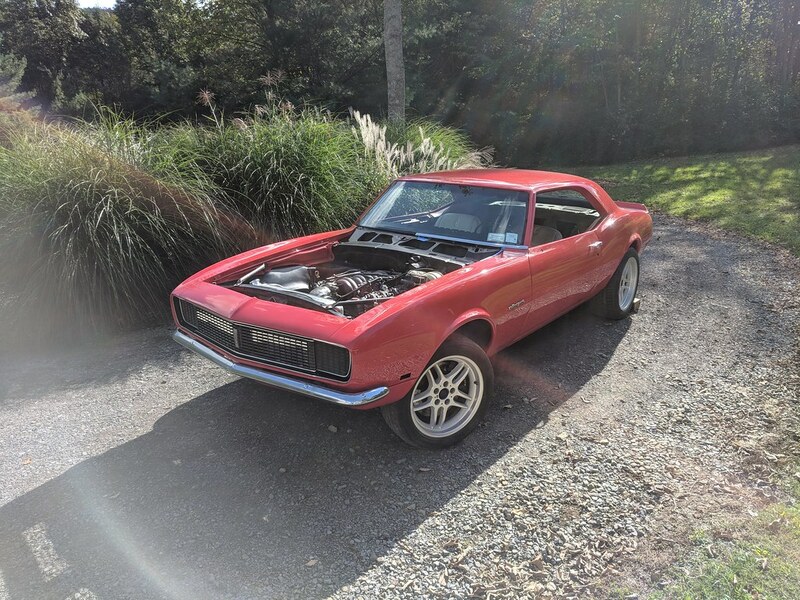 So long as you don't go crazy on lowering it looks like there'll be more than enough ground clearance, or you could be the first to stance bro a first gen Camaro either way. Haha Box. I'm definitely not going to stance my car, but that is an interesting thought... I'm just hoping to get the front to match the rear or just slightly less gap. Right now it's sitting about 3" higher than the rear! Not sure what a 'stance bro' is. 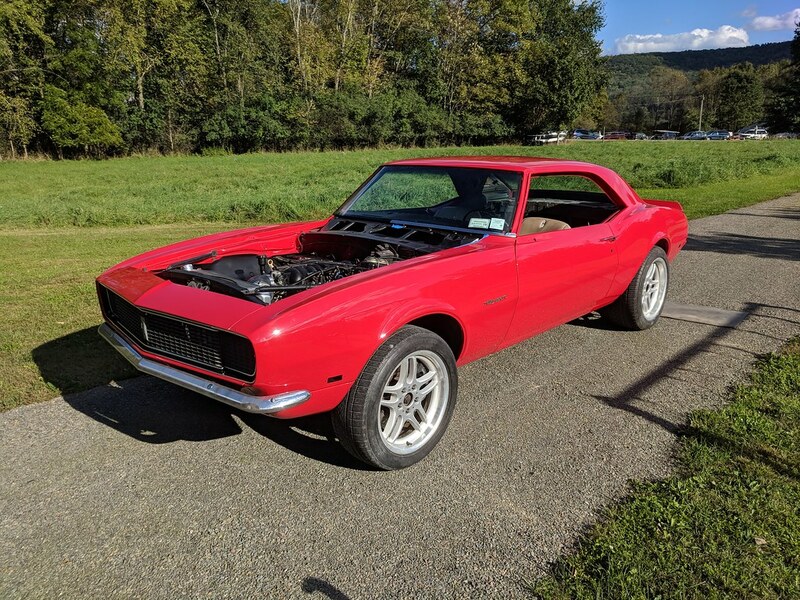 Are you heading to fall Carlisle Ryan? You ever see the tuner cars where the tires are way undersized and kicked way out at the bottom? That's a stanced car. Not my taste, but who am I to judge. I've been thinking about it, but went for broke to get the car running/driving and don't have any free cash at the moment. Definitely in the Spring though. Gotcha, I was thinking it was the giant oversized wheels. I understand about the swap meet. I live close enough that its not that big of a deal. Stars are aligning properly at the moment and it looks like I will be able to make the trip this time. Not really looking to buy, I just like going. Just think of the challenge of getting camber into the rear though. Nah I don't get it either, but I'm a function over form kind of person. That said I like lowered, but I still want at least an inch or so between the tire and fender/quarter for aesthetics and functionality. To me having the tires shoved up into the fender/quarter doesn't look good, but that could be my logic talking more than anything. I was thinking on the trans cooler ports on the radiator. My 1999 suburban had oil cooler lines on that side (drivers). The trans cooler lines ran down the passenger side. In fact I have never seen a GM with trans cooler lines running down the drivers side. Not that I have tinkered on alot of them. Not sure exactly how you would plumb it, but i think in theory you could use those to cool the engine oil. just a thought for putting those ports to use. Built in "coolers" on radiators are more like warmers than anything, it's just a brass tube circling through an area of moving coolant. Unless whatever going into the radiator is marginally hotter, and in which case you have a problem with most any fluid you want to be cool, it won't do any cooling really. 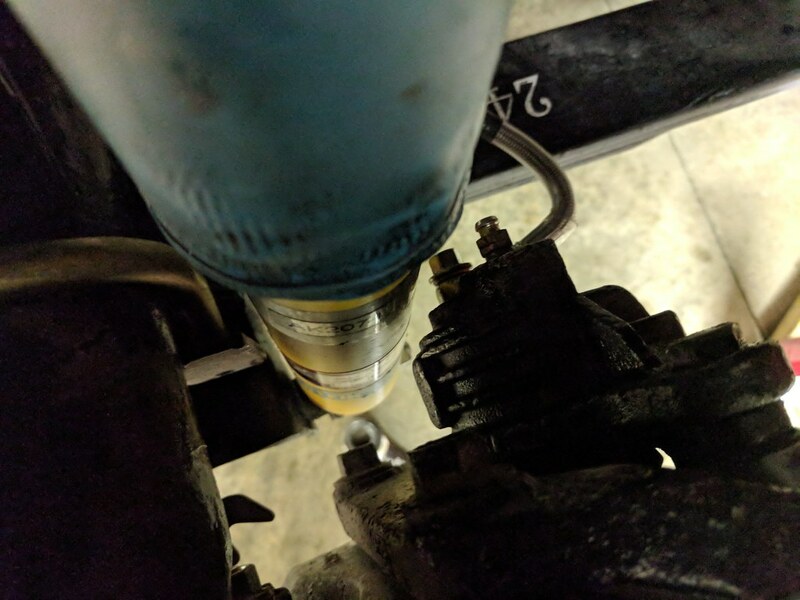 The reason automatics have them is more so for getting the trans fluid up to operating temp for efficiency and shifting smooth sooner, and especially in the cold. 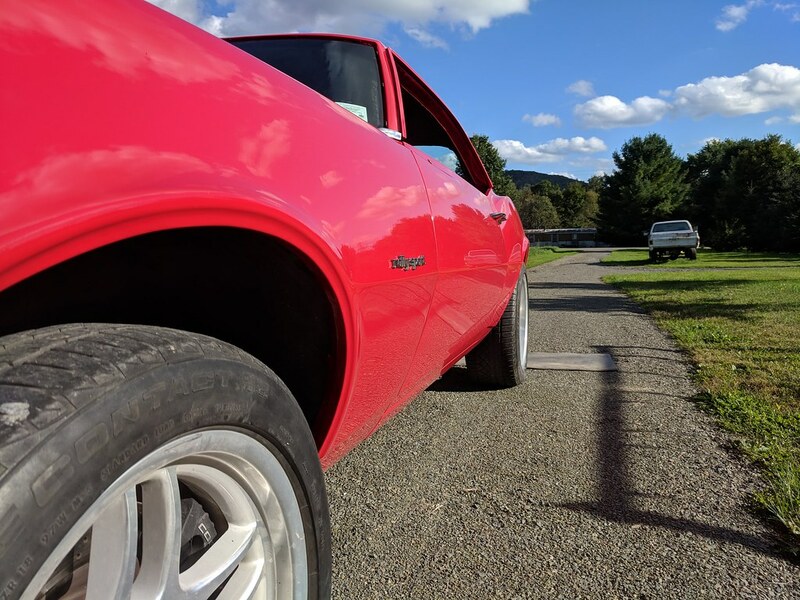 Though I can't foresee the need for standalone coolers unless you're racing it or in extreme heat climates, or that particular component in a particular car is notorious for overheating stock like the 4th gen power steering. I thought I saw somewhere online that had plugs for those ports so that is likely what I'll do at this point. Unless I have an issue with overheating, I'm likely going to keep them plugged. The only other thing that I had considered was possibly plumbing up my PS like box said. Since I have 4th gen engine accessories. I really like this build! Thanks Mike! I still haven't used my NPD gift card yet. I'm hoping to place an order after at some point in mid January. They expire at the end of February so I can't forget. I made a ton of progress this weekend on the car. 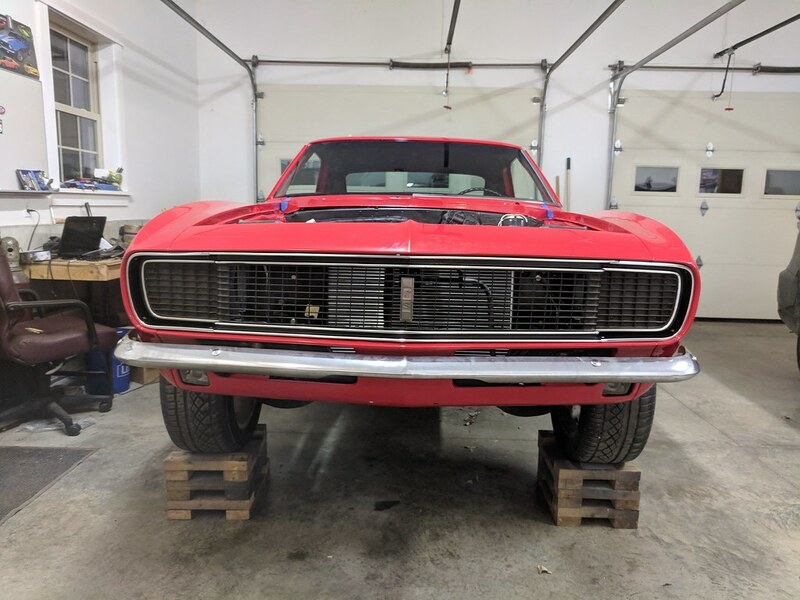 I have been slightly held up because the last thing I needed to do to button up the engine install was getting the balancer bolt torqued properly. 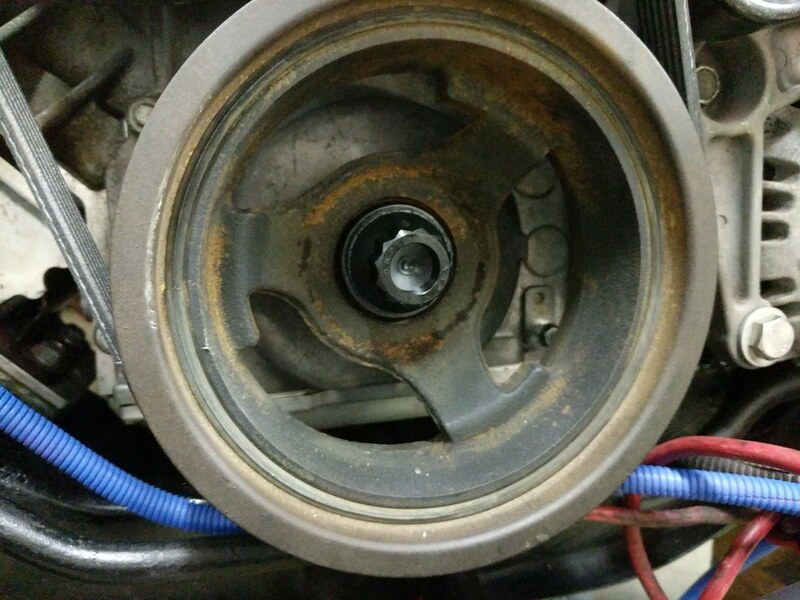 After dropping the starter on my face while under the car, we managed to get the bolt torqued down. Once that was done it was go time. I had been cleaning up parts like the core support so I can just bolt it all back together. I didn't take a whole lot of pictures during the re-assemby. I was busy working and it's been apart so many times that I didn't want to be redundant. Here are a few along the way. One thing that gave me a bunch of trouble was the driver side turning signal. The socket was corroded and the spring that kept pressure on the contacts was rusted away. So I ended up swapping sockets with another 67 turn signal and it worked out perfectly. I really wanted to keep the original 68 housings that I got at Carlisle as they were off of an original 1968 Z/28 RS in Tripoli Turquoise. There was even a little Turquoise overspray on them. Sounds dumb, but I really like having original parts on the car verse reproduction parts. Even if they aren't in the best shape. 90% of the RS parts on my car are original GM parts. 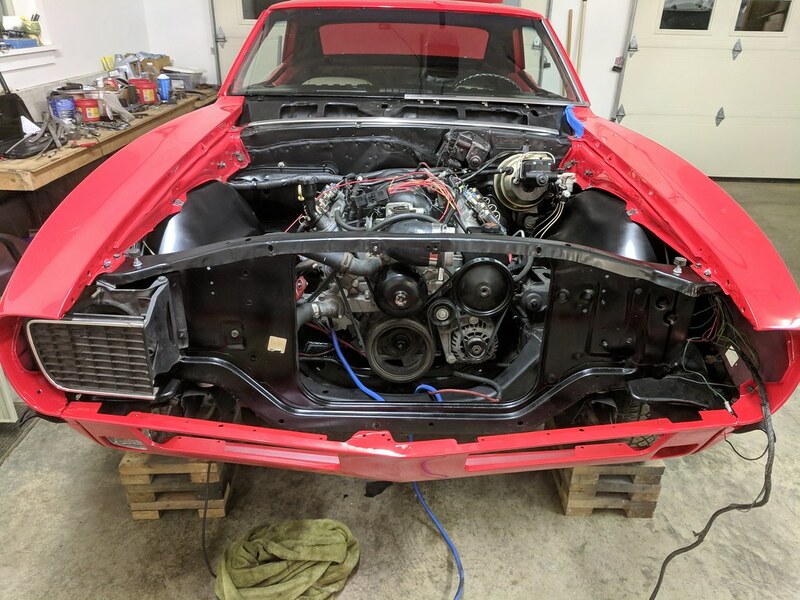 Anyway, here is the car with the front end all back together. I'm so happy with the way it turned out from the paint to panel alignment to ease of installation. 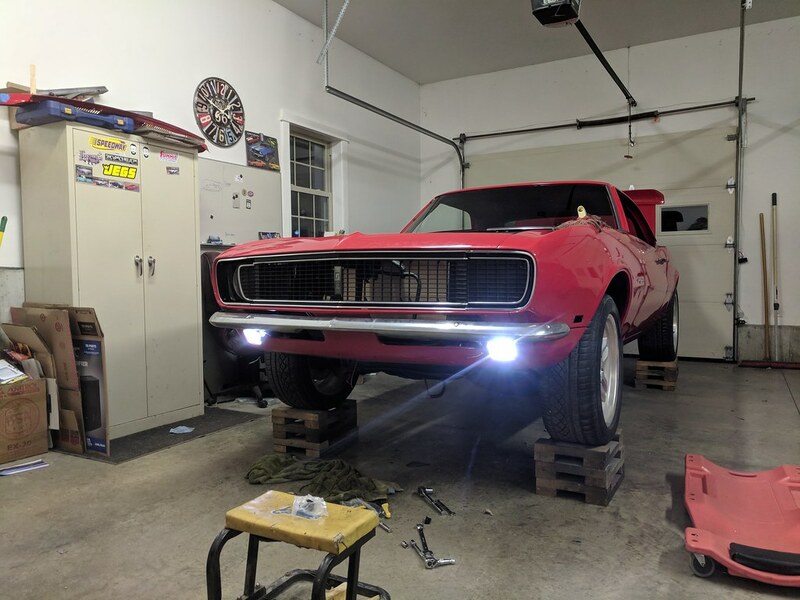 I also installed a set of the LED switchbacks I picked up a long time ago. They are white when the lights are on, and when the turn signal is activated it turns to amber, then pauses and turns back to white when the signal is canceled. Pretty slick and they are super bright. I want to get a set for the tail lights as well. Another shot of the engine. It really looks like home in there. I still need to clean up some of the wiring loom, but very happy with the results. 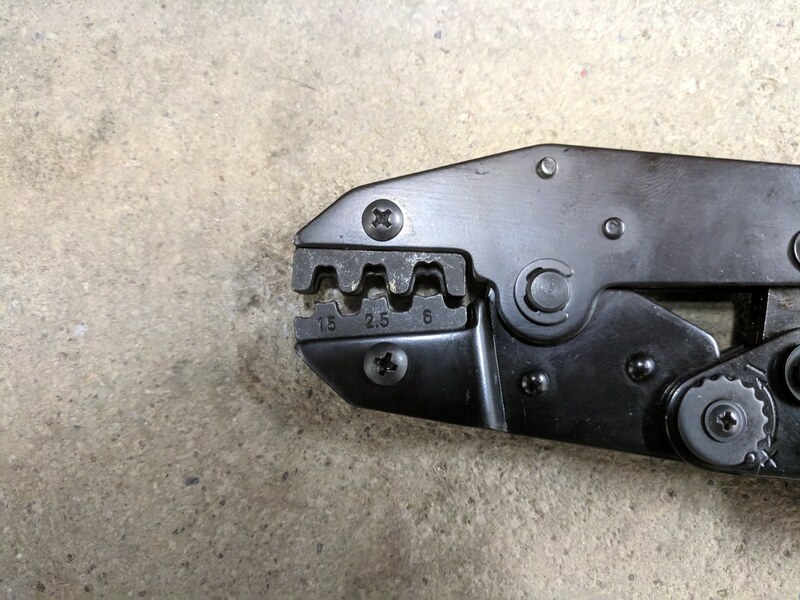 I also thought that I would share in a tool that I bought for crimping the Packard 56 terminals. It still needs to be slightly modified as it bents the bottom of the terminal slightly, but overall for the $15 bucks I paid it does a great job. It's a ratcheting type that has interchangeable jaws so it does a few other functions as well. Out of the box it does 90% of what I want it to do and once I modify the one jaw I'll update this thread with a perfectly crimped terminal. The moment that I have been waiting for since I bought this car almost 3 years ago, my first test drive. 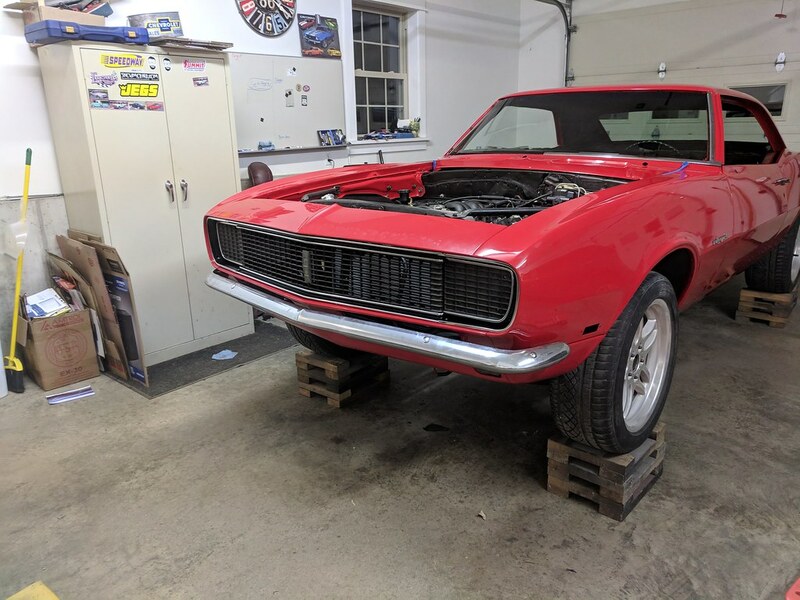 I worked all night Friday to get the car back together, then for several hours on Saturday afternoon while the kiddo was at his grandma's and the wife was jogging. It was finally close enough for me to get it out on the open road. My father-in-law stopped over and gave me a hand giving everything a once over to see if I missed anything simple that could give me an issue. 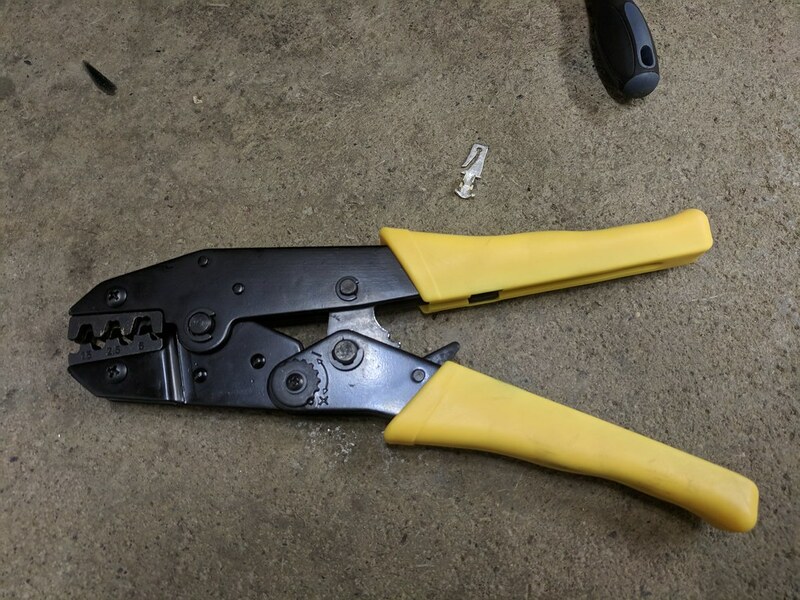 He found a hose clamp and a few loose bolts. After that it was game on. I started it up and pulled it outside to let it get up to operating temperature. Once it was up to 187* I verified that the thermostat was operating and headed down the drive way. 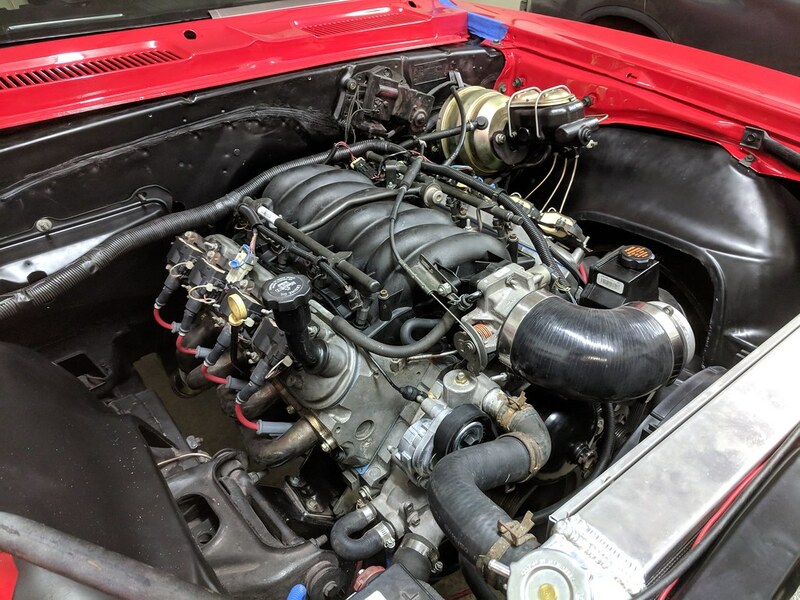 I only got a few pictures because it was just me and I didn't want to get busy taking pictures and miss something like no oil pressure or overheating. My first stop was to the gas station right down the road from me. Of course it was super busy there and I had to dodge traffic with an unfamiliar car, new clutch, fresh paint, and etc. Topped it off with 5 gallons of 93 and headed over to my parent's house about 5 miles away. My mom knew I was coming over, but my dad had no idea. He knew I was close, but not that close. He was super happy for me and just kept looking at the car. I took him for a ride up the road and he was impressed with the LS power. I snapped a few pictures while I was there. My first impressions of the car are that it seems quite refined for having been totally stripped apart down the the bare shell. 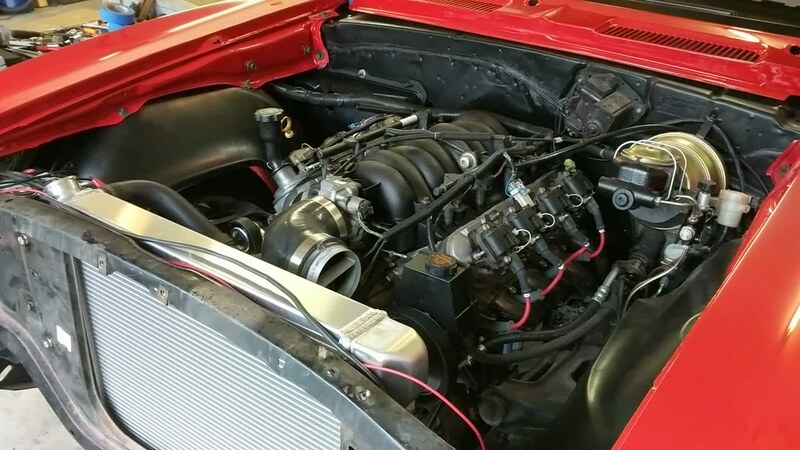 The engine and transmission worked together perfectly as it revved freely and shifted smooth and firm. I have about 40 psi oil pressure at idle and had about 60 psi around 4500 rpms. 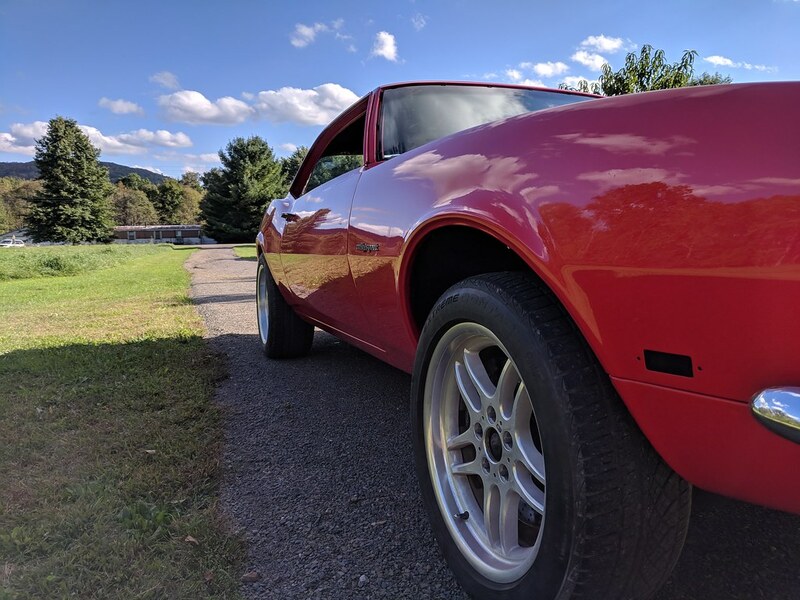 The clutch is brand new so it will likely take a few hundred miles for it to be fully broken in, but after driving it around it feels great so far. My Vaporworx modified 5th gen fuel pump was quite and provided all the fuel I needed. The chassis was tight and I didn't notice any squeaks or other strange sounds. I did notice some sort of suspension clunking sound on the passenger side rear end. 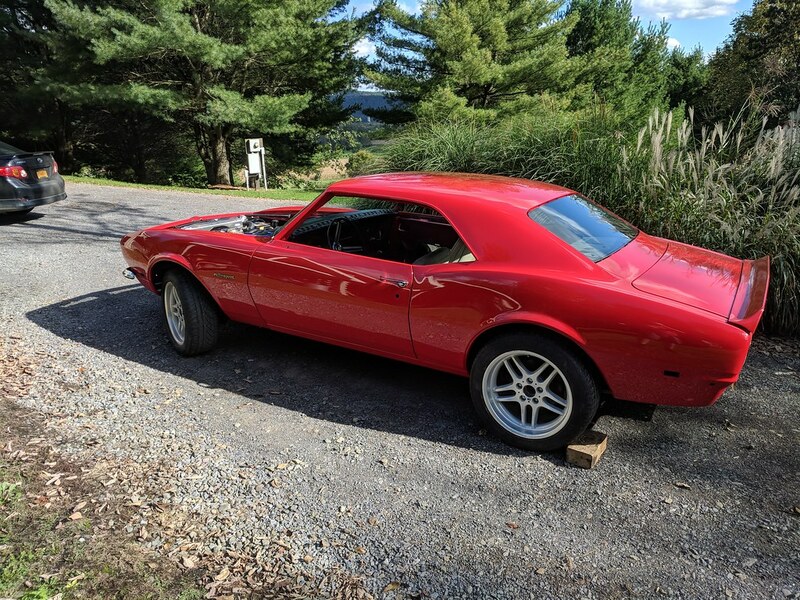 I haven't had a chance to see what it could have been, but I'm leaning towards either exhaust or possibly the caliper to shock. Hoping that it's not the second, but if so I'll need to modify it to gain clearance. 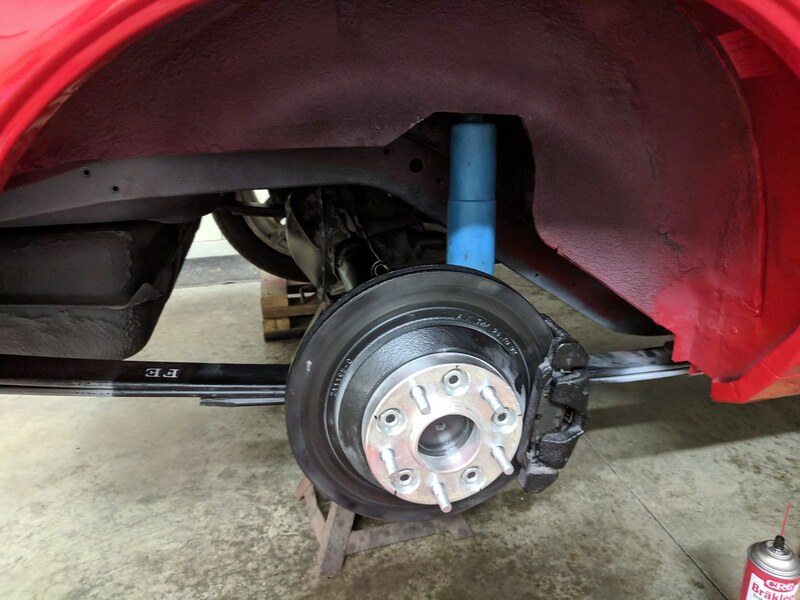 The front springs are DSE 2" lowering springs, but what I didn't realize was they are designed to be used with their lower control arms as they have a drop pocket built in. So with them installed it actually raised my front ride. 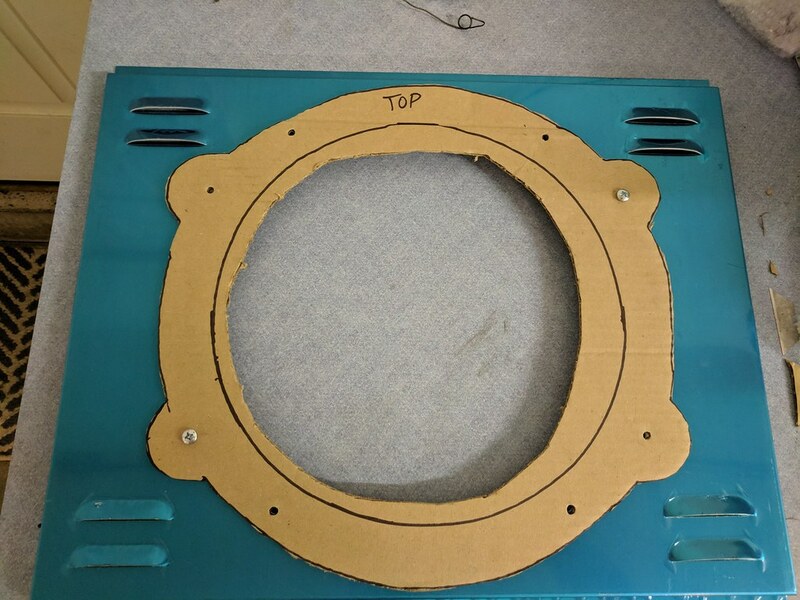 DSE said that I would need to cut roughly 1/4 coil for every 1/2" I want to drop the wheel. I'm going to need to cut 1 coil to drop it down 2" and see where it settles from there. 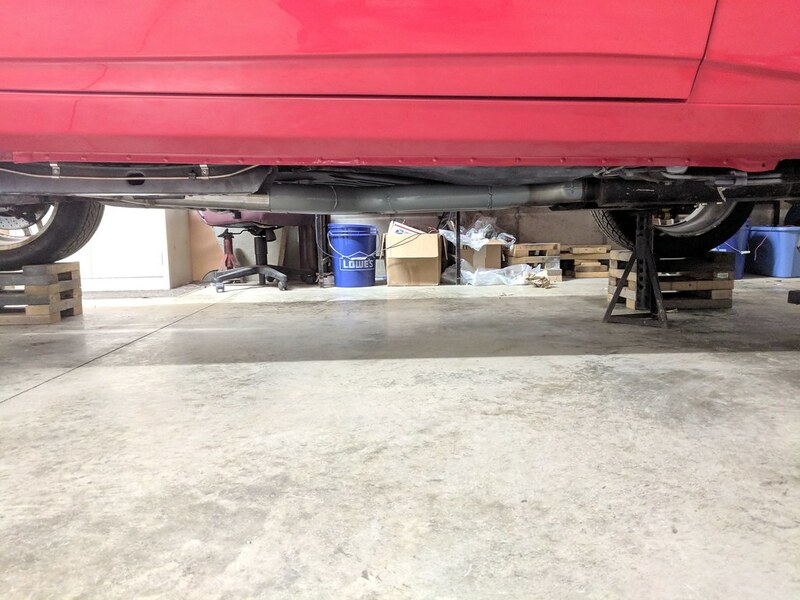 Once I cut the coils I want to get it aligned as I think currently the car is toed in as it wanted to dart when driving down the road. Overall, I couldn't be happier with a first time out. It performed flawlessly and was very fun to drive. Once I straighten out the few issues I have with the car it should be very reliable. I also noted that there were zero leaks on the car. I re-used some of the gaskets on the LS motor and figured I might have an oil leak somewhere, but I can happily report zero leaks. My buddy has a friend who does inspections and said that he could get my car in possibly this Friday so I can be 100% legal. Then I can maybe take it to one of the last cruise in car shows near me. congrats on the maiden voyage. Glad to hear you were able to do that. What's the status of the interior? did you settle on a hood configuration? Thanks man! The interior is MIA haha. I'm planning on running what I have which is some standard 1968 interior that is medium blue. I'm going to attempt to dye the panels black. If it turns out decent I'll run that for a while. 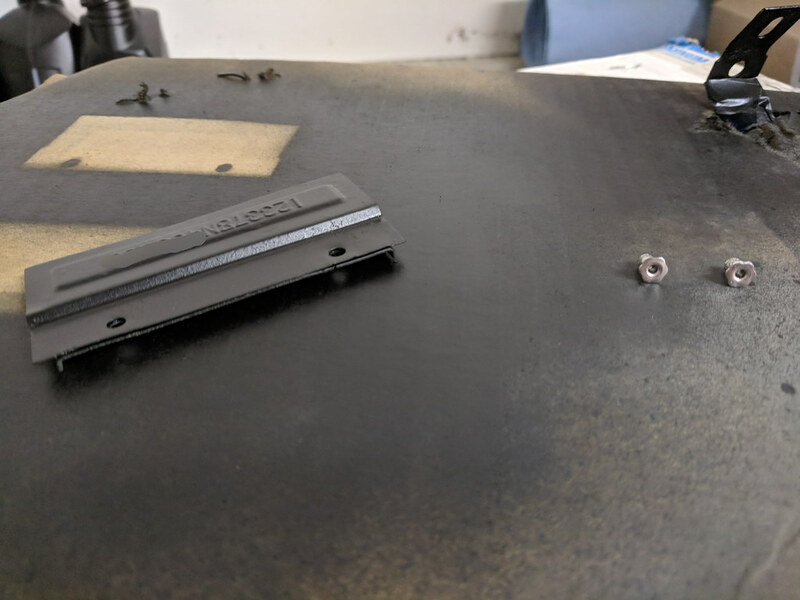 The original kick panels are black that are the panels my car was born with. Score! I'll get a new carpet and maybe some new seat covers. The problem I have is that interior parts add up quickly... 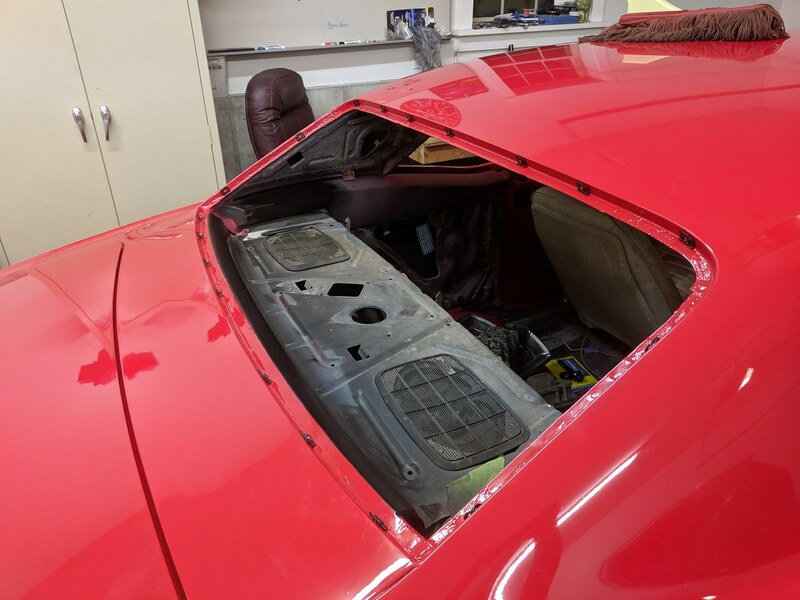 When I did my 1976 Trans Am the 1973 parts car I bought had a nearly mint interior which I took all of it. So I really never priced out the pieces new. 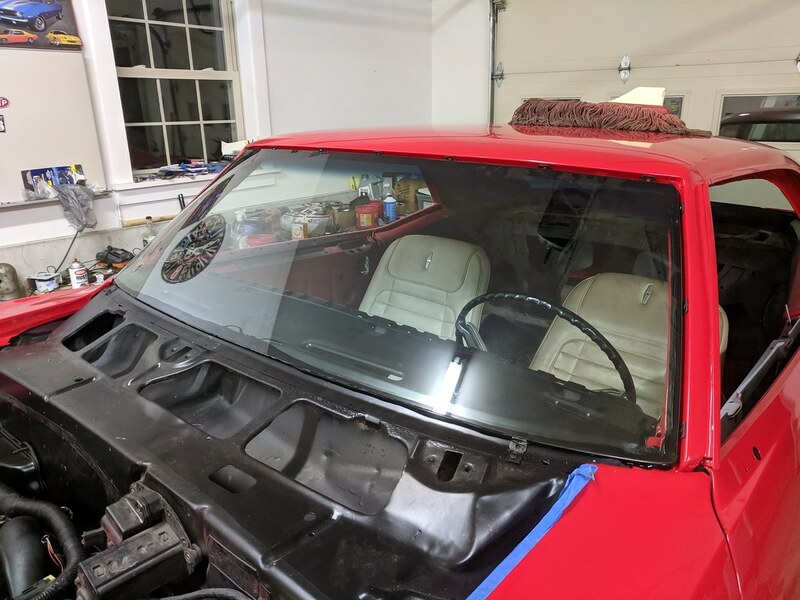 As for the hood I already have the cowl hood painted in my basement. Just waiting for the wipers to go back in first, then I can button that all up. 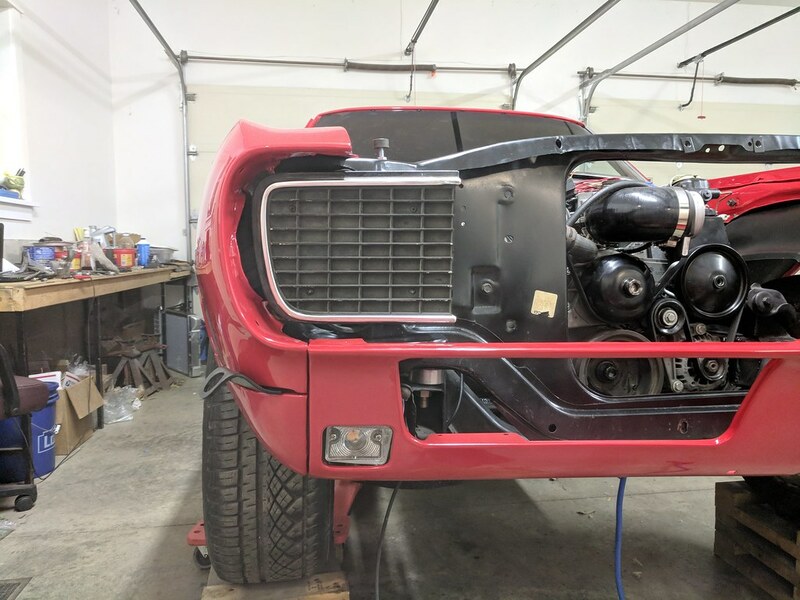 I'm very anxious to see the car panels 100% together. Don't blame you on wanting original parts, more often than not they always work better than aftermarket. Once in a blue moon you'll have aftermarket pieces that fit as well or better. Congrats on getting it "on the road" per se! Congratulations Ryan. You can see my other response in the "today I" thread. Love the car, love the rs. You gotta love that "First Drive" !Great work as always! Awesome.....inspiring work, Ryan. Well done!!!! Thanks for all of the positive feedback! 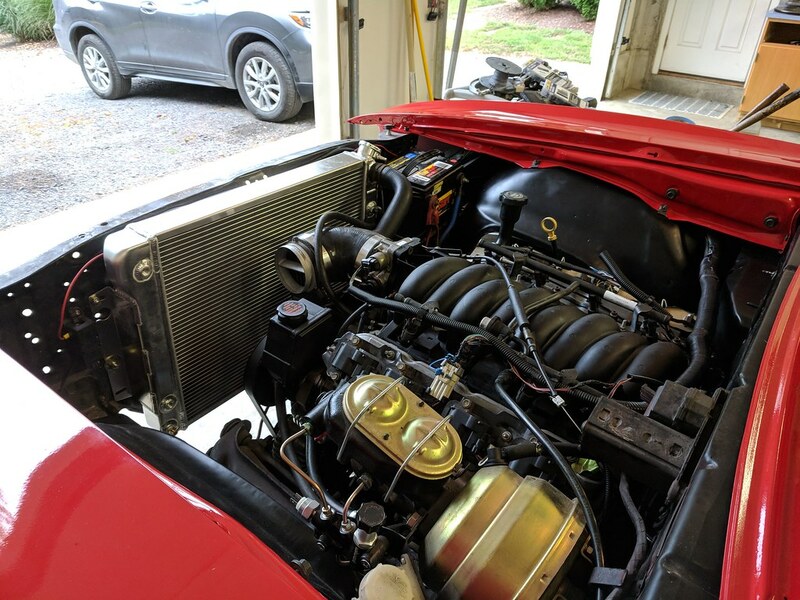 I am just so excited that the car is running and driving again. 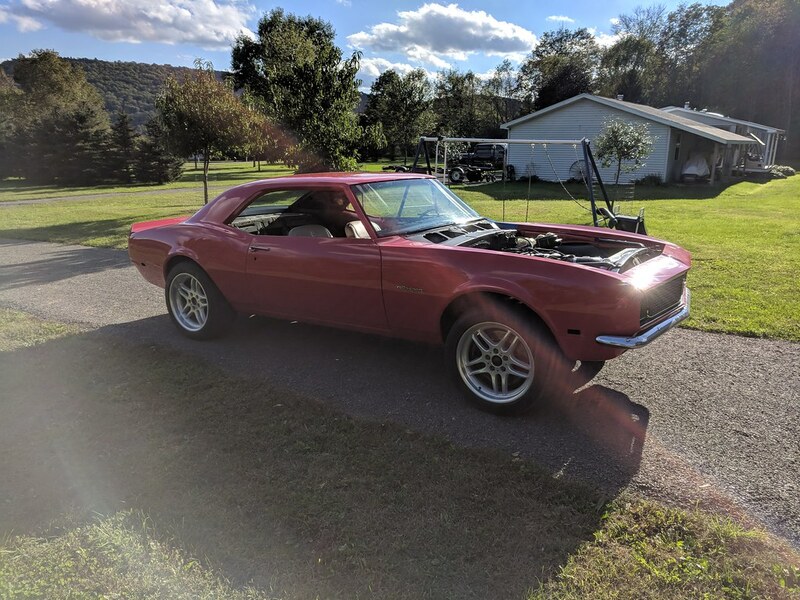 50 years ago this car was a brand new car off the showroom floor, and I gave it a new lease on life to hit the road again. I figured I would give another update since yesterday was so nice I decided to take the car a little further and continue with the rear gear break in process. Basically Richmond says with new gears I have to drive between 45-55 mph for about 15-20 min increments 3-4 times letting the gears get hot and fully cooled down each increment. I set my timer for 8 minutes and drove down a nice windy back road then will turn around and come back. The car performed flawlessly and just has tons of power everywhere. 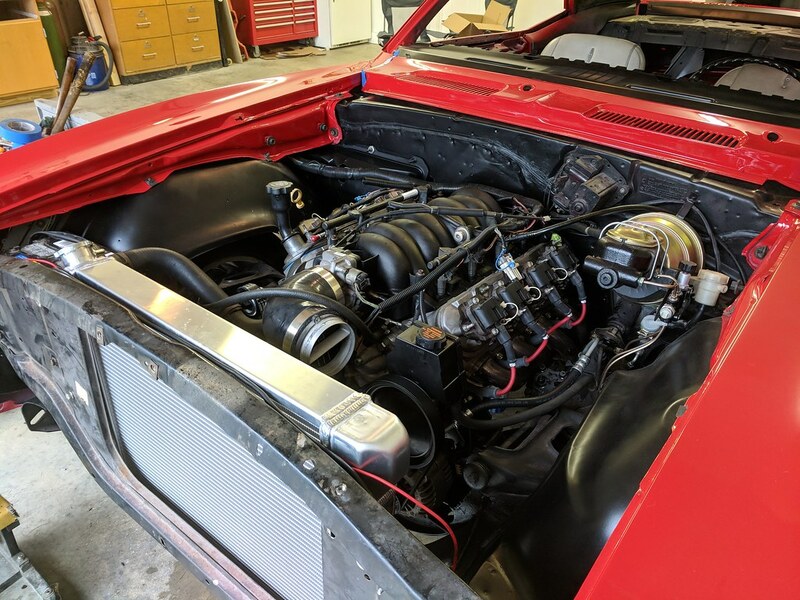 I'm so happy with this engine/trans/rear combination that it's hard to put into words. It chirps the tires when I shift in just about every gear, not on purpose mind you. On the way up and back the road I was taking it easy and just enjoying rowing through the gears. It was a beautiful sunny fall day which was why I couldn't resist taking the car out in the first place. On the way back on the long straightaway back to my house I just let the car rip. Wow, does it run. I was doing ~75-80ish before I knew it in 3rd gear. I took it up to 6k rpms and it sounded amazing! The motor just kept pulling and didn't want to stop. I can see myself bouncing off of the rev limiter in my future. The only thing that I really have to complain about is a few times the transmission was grinding going into gear. I'm not entirely sure if it was my rusty shifting skills or if the transmission is going to need some syncros soon. The other possibility is that the release bearing may need to be bled again. I also had a few squeaks and rattles, but that was expected. I'll narrow those down along the way. Congrats on the test drives and no major surprises encountered. But actually, we have come to expect no less from you and your car skills. Well done! Great post! It has to be exciting to drive your creation! Wish I could hire you to finish mine.